Hyperopia (also known as hypermetropia or longsightedness) is a common eye focusing problem, where the light rays that enter the eye are focused behind, rather than directly on, the retina. - The eyeball is slightly smaller and shorter from front to back. - The focusing mechanisms of the eye (cornea and lens) are too weak and unable to focus light rays onto the retina. 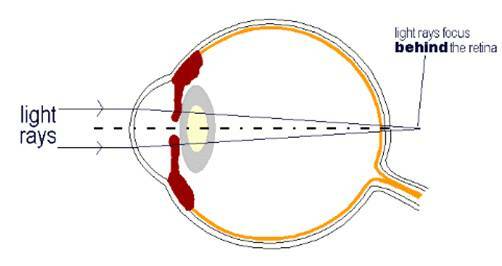 In normal eyes, the cornea and lens are sufficiently curved to converge light rays onto the retina. In hyperopic eyes, the cornea or lens (or both) are too flat. This causes too little convergence and the light ends up being focused behind the retina instead. Note: Hyperopia is different from presbyopia. 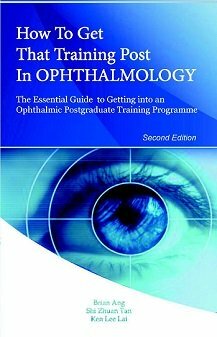 In presbyopia, the natural lens is no longer able to change its shape sufficiently to focus light from near objects to the retina, i.e. loses the ability to accommodate. This means that only the reading ability is diminished, while the distance vision is maintained. Presbyopia is caused by the normal aging process of the natural lens. It is not so much a disease but rather a degenerative process that occurs with age. This is the reason that many of us need to wear some form of near reading glasses by the time we are in our 40s. Longsightedness is reasonably common. It occurs in 20% to 50% of the adult population, depending on the race and country. Like myopia, it is also most common among Asians. Many children have some form of hyperopia when younger. However, as the eyeball grows longer with age, the longsightedness becomes less and less. WHAT SYMPTOMS CAN YOU EXPECT FROM HYPEROPIA? Longsightedness causes blurry vision when looking at near objects, but usually good vision in the distance (example below). Your eye is unable to focus at close up objects. Because of that, doing close-up work may give you headache, eye strain, double vision, poor concentration and fatigue. Some children may not ‘outgrow’ the longsightedness. If the vision is blurred (from the hypermetropia or any other cause), this affects the development of connections between the eye and brain up to the age of 7. When this happens, permanent blurry vision may occur, otherwise called amblyopia (lazy eye). Sometimes, a turn in the eye (strabismus or squint) may be noticeable. So make sure you and your child attend regular eye checks to detect any refractive error and to treat it appropriately. Spectacles and contact lenses are the commonest ways to treat longsightedness. They are usually able to give good visual acuity for most cases of hypermetropia. Usually, you will need to wear them all the time, especially when performing close up work. These lenses are converging lenses that refocuses light onto the retina. They have a plus sign, and are therefore called... you guessed it: plus lenses. The higher the number, the more myopic you are. For instance, if your long sight requires a lens power of +6.50 diopters for correction, then your hypermetropia is worse than someone who wears a +3.75 diopter correction. Left: In hyperopia, the light rays are focused behind the retina, causing blurring of the vision. Right: A convex or plus lens placed in front of the eye helps to converge the light rays so that they are refocused onto the retina and thus sharpens the vision. Conductive keratoplasty involves reshaping the cornea without cutting or removing tissue, to allow light entering the eye to become focused uniformly onto the retina. Unlike laser refractive surgery, conductive keratoplasty reshapes the cornea with low energy radio waves. The radio waves are applied to specific spots around the outer cornea in a circle. By shrinking the corneal tissue, the cornea becomes steeper. This enables light to be focused onto the retina during close up work. This is suitable for low levels of hyperopia. Laser refractive surgery involves reshaping the cornea so that light entering the eye can be focused uniformly onto the retina. There are different techniques available, including photorefractive keratectomy (PRK) and laser assisted in situ keratomileusis (LASIK). In PRK, the laser removes micro-thin slices of your cornea. In LASIK, the laser creates and lifts a flap of cornea before remodeling the tissue underneath. The flap is repositioned once remodeling is complete. Wavefront technology now enables hypermetropia correction to a very precise level. This means that you are unlikely to need glasses or contact lenses after laser refractive surgery. Complementary therapies range from eye exercises to acupuncture to herbal remedies. Most of these treatments help by alleviating the symptoms of eye strain from untreated refractive error rather than permanently curing your hyperopia.